mean ol' meany: WTW - Jimmy Pete Wins Again! WTW - Jimmy Pete Wins Again! I took my family out to dinner the other night cause I have won some money at bingo. 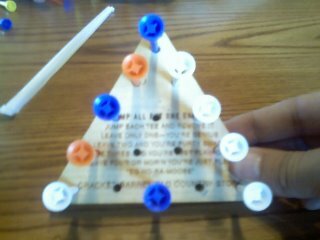 We went all out at the Cracker Barrel. On them tables they got a smartness game and Jimmy Pete done real good. If you leave 4 or more you are a "ig-no-ra-moose." JP left ten. See the rest of the family on my sidebar! You go now!